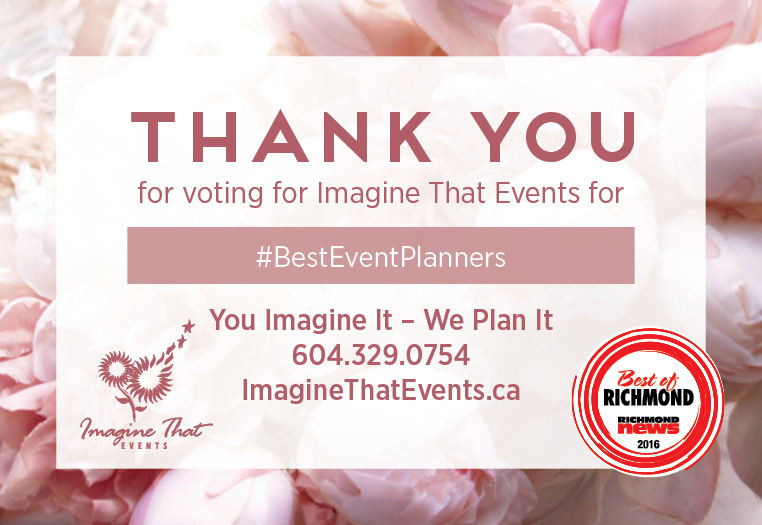 Thank you for voting us Best Event Planners 2016 in the latest edition of Richmond News Best of! We are honored and humbled. Our amazing customers’ limitless imaginations inspire us to conjure up magical moments every day. Our team at Imagine That Events have nothing but gratitude for the City of Richmond. 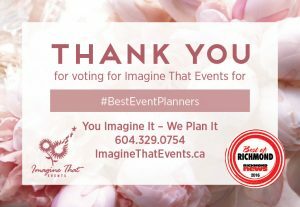 With special thanks to the Richmond Chamber of Commerce, River Rock Casino Resort, Pacific Gateway Hotel, Sheraton Vancouver Airport, Mayfair Lakes, Richmond Golf Club, Vancouver International Airport and all the Richmond businesses that that we have been building relationships with over the past 14 years.